The fact that the city didn’t disclose all of these “extra” payments is evidence that pension fund trustees knew that those “extra” payments were actually crimes. I.e., they knew they were looting the pension funds. Thus, “nearly everybody” who’d worked for Detroit was complicit in looting their own pension funds. I.e., looting theirown pension funds was simply part of the city’s “culture”. A criminal mentality to take whatever you could get was accepted as normal within the city of Detroit. Yes, the government always sticks it to the idiot “taxpayers”. And they’d do just that in Detroit except the taxpayers (those private workers and businesses who actually earned an income) have largely left Detroit. The loss of privately-employed taxpayers creates a big problem. The city government is incapable of funding its own pension programs. The government produces nothing. The government can only fund its pension programs by predating on private taxpayers. In fact, all government is inherently parasitical and can’t survive without privately-employed taxpayers to pay for government excesses. Thus, Detroit’s pension funds will no longer be funded by privately-employed taxpayers. More, the pension funds that former city workers, themselves, helped to loot, will disappear. Government pensioners will scream at the injustice of losing their pensions, but insofar as they didn’t mind looting their own pension funds “back in the day,” they have no moral ground to complain about their losses. I suppose that a lot of Detroit’s government employees were singing “let the good times roll” back in the day when they were looting their own pension funds. Now, they’re crying the blues because the pensions are gone and the good times have ended. People who loot their own pension funds are just like people who riot and burn down their own neighborhoods. They’re stupid. Americans who support all these damned foreign wars are exceptional alright. They’re exceptionally stupid. Nations that expend their lives and treasure fighting for “interests of all” other nations (and many special interests) necessarily incur costs contrary to their own best interests. By fighting other people’s wars, we’ve weakened ourselves and diminished our own ability to defend ourselves if we’re called to fight our own wars. Americans who allow their government to engage in foreign wars that have no national value to are just as stupid as the city employees who loot their own pension funds or demonstrate by burning their own homes to the ground. In “Syrian Civilians Bore Brunt of Rebels’ Fury, Report Says,” The New York Times reported that that the primary victims of the current civil war in Syria are the Syrian civilians. “The civilian casualty ratio in an armed conflict is the ratio of civilian casualties to combatant casualties or total casualties. The measurement can apply either to casualties inflicted by a particular belligerent or to casualties in the conflict as a whole. The 10:1 ratio may be disputed, but it’s almost certainly roughly correct. The lesson in the civilian casualty ratio is that civilians (a/k/a “taxpayers”) will be held liable for their own governments. Insofar as Syrians allow themselves to be ruled by tyrants, they’re liable for that government’s debts and crimes. Therefore, if someone attacks the government of Syria, it may be cruel and harsh, but’s still fair that Syrian civilians be gassed, wounded or killed. The civilians are responsible for their government’s crimes. They are responsible for allowing a criminal elite to take control of their government. Similarly, if Syrians have a good government but fail to support and defend it against attack, the Syrian civilians will be held liable for their failure. Again, it will be fair for them to be gassed, wounded or killed by the attackers and their new government. War may have once been “honorable” insofar as warriors fought other warriors. The Battle of Waterloo was fought in A.D. 1815—a little less than two centuries ago. Napoleon commanded 69,000 French soldiers; the Duke of Wellington commanded a 67,000-man Anglo-allied coalition. Of these 136,000 warriors, about 50,000 were killed or wounded. But virtually no civilians were killed or wounded. In fact, civilians gathered around the perimeter of the battlefield to watch the fight, somewhat like people today gather in coliseums to watch football games or boxing matches. Back then, warriors fought warriors but didn’t generally attack the civilians. As a result, civilians often felt a special respect for men who were warriors. Today, our warriors no longer restrict their targets to enemy warriors. Instead, the modern warrior is 10 times as likely to kill a civilian as an enemy warrior. If war was ever “honorable” (warrior vs warrior) that time has passed. Today, war is psychotic in that “warriors” primarily kill “non-warriors” (civilians). There’s no honor in today’s wars. The fact that the people of Syria are liable to be gassed, wounded or killed is based on their responsibility for their own government. That same principle applies to all people, including Americans. We are responsible for our government. If our government commits crimes or is merely corrupt or even stupid, we may be held liable. In the same sense that people who loot their own pensions funds are liable for the pension losses, and people who demonstrate by burning down their own homes are liable to pay the cost of rebuilding, and people who allow their government to engage in wars that are none of their business are stupid and liable for their stupidity—so are you and I. Therefore, the people who believe that, since they didn’t personally do anything wrong, they shouldn’t be held liable for by or for their own government are mistaken. It’s not enough to avoid doing something wrong. You have to get involved and make sure the rest of the sneaky S.O.B.s also don’t do anything wrong. Life is not a situation comedy. If you were watching Dancing With the Stars rather than watching your politicians when your government trashed the Constitution or invaded yet another foreign country, you may be ignorant, but you’re not innocent. More, when the day of reckoning arrives and you’re held liable for your indifference, apathy or fear, you’ll be in for an unpleasant surprise. Those Americans who trust government to manage our affairs in our own best interests are fools and will be held to pay a fool’s price. In essence, illegal aliens claimed tax credits for nieces, nephews, cousins who still lived in Mexico, or even for children who didn’t even exist. Based on these tax “credits,” illegal aliens who may have earned no taxable income were nevertheless able to gain significant tax refunds from the IRS. Note that the IRS handed out a free $4.2 billion to illegal aliens in the single year A.D. 2010. We can therefore suppose that similar sums were also handed out in A.D. 2008, 2009, 2011 and perhaps 2012. It’s conceivable that the IRS has handed over as much as $20 billion to illegal aliens since the onset of the Great Recession of A.D. 2008. During a recession, illegal aliens would be among the most hard-hit. They’d be less able to find or hold jobs. The stress of the Great Recession undoubtedly slowed the flow of illegals into this country and caused many who were already here to return to Mexico. However, by means of these billions of dollars in “tax credits,” the IRS helped many illegal aliens to stay in the U.S. rather than return to Mexico. We don’t even know who made the decision enrich illegal aliens at taxpayer expense?! When do we find out which “midlevel bureaucrats” made these decisions? When do heads begin to roll? And, of course, whatever criminal, treasonous acts were committed by anyone in the IRS (or in government at large), they certainly weren’t committed, instigated or approved by our beloved Congress, White House or courts. It was the “little people”—the faceless, anonymous, incompetent mid-level bureaucrats—who are responsible for paying billions of taxpayer dollars to criminals. Surely, there was no criminal intent to encourage illegals to enter this country. Surely, there was no criminal intent encourage illegals to stay in this country. And of course, there was no criminal intent to rob the taxpayers to enrich the criminals. Right? I.e., just as looting their own pension funds was simply part of Detroit’s “culture,” looting the American taxpayers’ funds for the benefit of illegal aliens is part of the “culture” of the IRS. And Congress. And the White House. Both Detroit and Washington enjoy a criminal inclination to take whatever they can get from the taxpayers and use that money to curry favor with non-taxpayers, criminals, special interests and also to feather their own nests. And why shouldn’t the government rob the American people? After all, the people are such a bunch of weak, apathetic, ignorant dummies that they’ll never really “do anything” to cause the government to held accountable—will they? Instead, the people of Detroit and of the United States will watch and wait until the day when they find out that their own pension funds and their own futures have been looted. Then, they’ll scream and shout and demand that somebody else (probably their children or grandchildren) be made to pay in order to replenish the pension funds and government accounts that are finally shown to “mysteriously” empty. Sure, the crime of handing taxpayer moneys to illegal aliens has been “known for some time”—perhaps several years. But nothing’s been done about it. No one’s been punished. No one in government has even initiated a serious investigation. Instead, it’s apparently been hoped that the issue would blow over like so many of the other “dandelions” that grow so commonly around government. And, again, whoever (if anyone) is actually responsible for this financial abomination, it’s surely the faceless, anonymous “midlevel IRS managers”—but definitely not anyone in Congress or the White House. Definitely. My position on all of this is a little extreme. I believe that whoever’s responsible for handing billions of dollars to illegal aliens should be found and tried for treason. If they’re found guilty, hang ‘em within an hour after the trial concludes. Hang them on a gibbet built in front of the place where they worked (be it an IRS office, Capitol Hill or the White House) and make sure that everyone who works in that office witnesses the hanging. I suspect that a series of public executions for treason might go a long ways towards restoring a respect for the law among our government employees and elected officers. But that’s just me. Kinder, gentler people insist that a good slap on the wrist should be enough to penalize any governmental crook. The Washington Times continues, emphasizing for the third time that, whoever was responsible for handing billions to illegal aliens, it definitely wasn’t one of the “big boys”. Uh-huh. The fact that evidence hasn’t been found doesn’t mean that evidence doesn’t exist. In fact, if we’re dealing with a real crime, the criminals responsible may have hidden or destroyed any such evidence. If the study is honest and complete, then the “big boys” at the IRS and in Congress are still our buddies and pals, and they’d never do anything to hurt the American people—other than turn this country into a police state, violate the Constitution, ship our industries and jobs overseas, raise taxes to intolerable levels, burden us with a debt too great to ever be repaid and take a little graft on the side to feather their own nests. Billions (perhaps tens of billions) of taxpayer dollars have been paid out to illegal aliens by the IRS, but no one important at the IRS or in Congress could possibly be responsible. In fact, no one will probably ever be identified let alone held liable for the “dandelions” that just seem to grow and grow in the compost we call government. If the American people are stupid enough to believe that none of the “big boys” are responsible, then the American people are just as stupid as Detroit city workers who were complicit in looting their own pension funds. Both groups of morons deserve to see their taxes raised, their economy collapsed, and their pension fund (So-So Security) looted just like that of the City of Detroit. And, in fact—as all of you already know—the taxpayers’ So-So Security fund has already been looted. Just like Detroit, our beloved national gov-co needed the SS money to fund many its various “good deeds,” “compassionate acts” occasional wars—and graft. The day is coming when US taxpayers discover that their So-So Security pension fund is (OMG!) empty! The poor taxpayers will shocked! Shocked I tell you! They’ll scream like the city workers of Detroit that their pension fund empty [!!!] and somebody else (maybe their kids and grandkids) must be made responsible to refill it. Corruption: it’s part of the culture of big government and therefore deemed to be unremarkable and unobjectionable. We see the corruption. We wink. We grin. We ask “Where’s mine?” We loot our own pension funds and our own futures and think ourselves slick. Most Americans have stupidly accepted a culture of lawlessness and corruption in their government. Like the city workers or Detroit and the Syrian civilians, most Americans will be held liable for that stupidity. Stupid is not, as Forest Gump said, simply “as stupid does”. It’s also “as stupid gets”. Those American who’ve insisted on their right to remain stupid are going to “get” a penalty that may make their ears bleed. Staying stupid is not a viable choice. If Americans want to survive, they’d better get smart and stay smart. Soon. The beast is dying. Now let's help it die. We all saw the cataclysmic failure of the Obamacare Exchange roll out. The $632 million dollar computer system worked about as well as a ‘women’s rights’ conference in Mecca. Whether the shameful, expensive and embarrassing Obamacare failure was planned or not, it proved yet again, Obama and Obamacare cannot be trusted. It cannot be trusted with our information, money, Constitution and it sure cannot be trusted with the details of our lives and healthcare. Obamacare revealed itself to be run by a deranged and messed up 632 million dollar computer system that couldn’t tie a shoe let alone take calls and sign ups. Apparently, there was a jump from the deadline sign up date in January 2014 to March. Isn’t that special? What Obama and his insane Obamacare handlers don’t want to see is that roll out was not just a messy rainstorm. It was the bombing of Hiroshima! Who would trust their personal health information, money and lives with this healthcare impersonating machine now? As the House and Senate go back and forth and Obama has nothing to say about the unbelievable failure of his Obamacare dream, America is suffering. Insurance rates are doubling and tripling, while thousands are being dropped from policies simply because many insurance companies aren’t complying with Obamacare, so they just cancel clients. Most are already dropping coverage and increasing rates dramatically. Death panels are in play and care is being denied millions of seniors, certainly quality care in time. We have an Obamacare emergency on our hands, while the House and the Senate argue and Obama smiles. I call on all Americans to make a real and lasting statement. Don’t march on Washington or drive trucks around in protest. Let us all agree to do the ultimate civil disobedience in the face of this incompetent, UN constitutional, health killing, illegal and forced Obamacare. Let us all NOT sign up for any exchange. Only 1 out of 10 can apparently sign up anyway since the computer glitches are the size of MARS. If there ever was a time that we as angry Americans must focus, exercise a little courage and stand against something tyrannical – Obamacare, it is now. Do not sign up anywhere! What are they going to do – fine and arrest millions of people? If so, how are they going to arrange and organize that…with their $632 million dollar computer that doesn’t work? Perhaps they have in the wings and ‘Arrest the disobedient people’ computer that costs $754 million. My dollar store calculator works just fine. Let us all help Obamacare fulfill its destiny. I have 3 words for you. ‘Swirling toilet water.’ Do not sign an exchange anywhere and contact your Representatives and Senators several times a week. Tell them you do not plan to sign up for any exchange and nor will your contacts. Also tell them that they had better figure out how to stop Obamacare or they will be ‘exchanged’ for someone else. Join me each day as I explore these and other issues on my national radio show from 7-10pm PAC at: www.therothshow.com. What will medical physicians do when there is no money from the government to pay them for services they performed for Medicare and Medicaid patients? What can happen to the Affordable Care mandated health insurance plan when not enough paying Americans sign-up? Will doctors get paid? I imagine that the wait for payment will be longer than three months if they get it at all. As politicians give their best performance of "showboat" on Capitol Hill, the news is reporting on doctor's offices and some hospitals are requiring patients to pay their deductable before they see the doctor. Depending on the plan you selected, that deductable can be in the thousands. Even if you chose the lowest deductable of say $500, not too many working Americans have that in their pocket. What all this is telling us is that medical professionals don't trust the government will pay them and they want their money upfront. Other medical offices are closing rather than deal with the burdensome red tape, expense and the possibility of not being compensated by the government. What are your personal options? For the most part the Obamacare stuff could be changing the landscape of the medical profession on a very personal level. People are used to doctors sacrificing their time and even waiving their fees in some cases. Americans expect their physicians to be taught to give of themselves, pull double shifts if necessary in order to care for the sick and injured. It is called compassion and the Hippocratic Oath. However, will the debacle going on in DC over the nation's healthcare dollars change the way doctors operate and how they view their patients and profession? For a moment ask this question; What if doctors did only what would benefit them – sort of like your average attorney or businessman? If you were asked by your boss to work nights and weekends you would expect to be compensated for giving up your personal time. What if the "doctor on call" becomes a thing of the past? We already know that the US and UK governments are willing to hold their country hostage over unaffordable healthcare and flu vaccinations, what would stop them from making outrageous demands on your doctor? Doctors who are able to are leaving patient practice and moving to teaching or management positions like Dr. Armstrong. Obamacare is removing the incentives for physicians to practice. As more people are forced into the cheaper Medicaid-type health coverage, it will lower the reimbursements doctors receive for care; if they get reimbursed at all. This would support the prediction that Obamacare will collapse as no one, including doctors, can work for free. Market analysts report that with less money to pay experienced American physicians the demand to use more physician assistants, nurses and foreign-trained physicians will increase. Other medical professional are banning together to open what are being called "boutique practices" and going off the insurance grid. This type of medical practice is where the self-insured can go and for a reasonable fee get emergency or traditional care. By avoiding the third-party payer system, physicians can work directly with their patients on pay-as-you-go for surgery fees. One such facility is the Surgical Center of Oklahoma. Modern allopathic healthcare has its place and this is with emergency trauma care. The so- called "prevention" healthcare of modern medicine does not exist because as any doctor will explain; it doesn't pay to stay well. 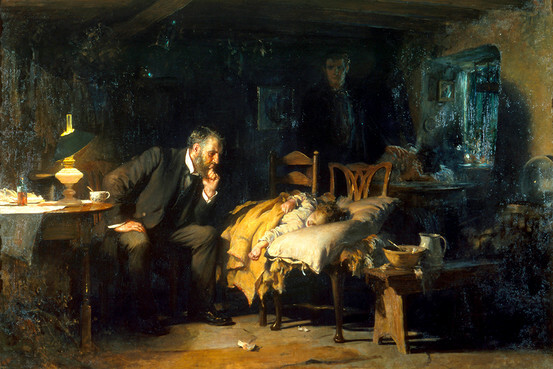 In 1949 President Truman took his turn at ushering in socialized healthcare and the American Medical Association used the 1891 painting 'The Doctor' by Sir Luke Fildes and plastered thousands of posters everywhere with the caption; "Keep Politics Out of this Picture." The AMA was successful at selling that sacred bond between patient and doctor to thwart socialized healthcare in 1949. Today unfortunately the bond between doctor and patient is changing and patients are merely a commodity. The healthcare situation is changing fast and we must be prepared and be more proactive in our own care. If Obamacare is not for you then you have a few affordable options which are considered acceptable by the current Affordable Care Act. You can obtain catastrophic healthcare and you will need to do your homework. One option I've been investigating is where you pay a small premium and the emergency-type medical bills are covered. The small stuff such as earaches, allergies and colds and flu bugs you are responsible for covering out-of- pocket. You might want to check it out for yourselfhttp://www.chministries.org/ . Personally the young and old would benefit from such a plan. When it comes to the out-of-pocket expenses for the common ailments we tend to experience annually (colds, flu, allergies, low energy etc.) you can do a whole lot with herbal supplements. If more people used the immune system herbs they would be building life-long resistance to many pathogens. An unvaccinated three-year-old who has not used antibiotics has a stronger immune system then the average 25-year-old. If you would like to learn how you can restore and build a super immunity call the experts in immune boosting and organ cleansing, call Apothecary Herbs 866-229-3663, 704-885-0277 online http://www.thepowerherbs.com , where your healthcare options just became endless. Check out three powerful immune system formulas called My 3 Amigos. Your immune defense for cold and flu season at a discount! MORE HERB SECRETS IN THE POWER HERBS e-BOOK. By popular demand The Power Herbs e-book is available with symptom/herb reference guide, information on organ cleansing and how to make your own herbal tinctures plus a whole lot more. You must have email to order and receive the e-book a PDF version ofThe Power Herb book for just $14.99. At this time, we do not offer this title in hard copy.